The trouble with fantasy dresses is knowing what to call the posts since I usually sort of doodle them when I am bored in class. I doodle a lot in class which shouldn’t surprise anyone. I was inspired partly by regency costumes and partly by the topic of “Relational Diagramming of Databases” which was the class in which I doodled these. I don’t think these are the costumes of a princess, but rather of a lady of the court. Someone who is wealthy, but not expected to dress to a certain code. Royal costumes were often symbolic or influenced by ritual attire and needs, so I tend to avoid them unless I can decide what the “rules” were. One of my favorite thing about the costumes of Queen Amidala in the new Stars Wars films (actually, her costumes are the only redeeming feature of those movies) is that they feel like the attire of a queen- ritual and restrictive. 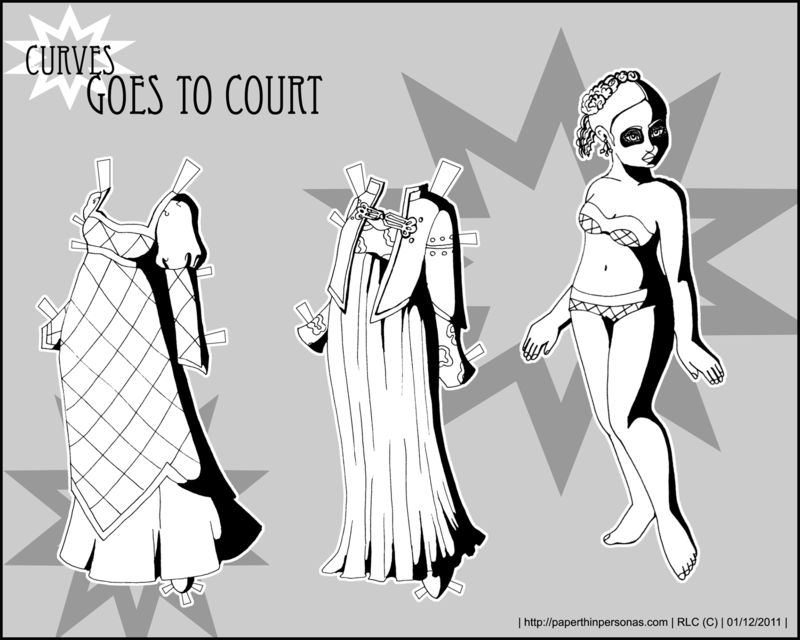 And while I intended this paper doll to symbolize a “Royal Court”, it is totally possible she is actually going to criminal court for having done something like poisoning her husband, or not, depending on how nice you want your paper doll to be. Heh, you could colour the one with the jacket to be all red and black for her court date; the oriental influances go well with the sharp dressing villianess theme (old movies teach us that if there’s an oriental guy in the film, he’s the villian). That’s a terrible thing for me to have said though, I shouldn’t go around making fun of old movies like that. Thank god for Bruce Lee. Okay, Sara, they should be all fixed. I think.